For over 100 years, BB young people have been achieving the Brigade’s highest award, The Queen’s Badge (formerly King’s Badge), and since 1968, the President’s Badge. Whilst these are long-established, there are some Companies which are offering the awards for the first time, or perhaps following a considerable time without any young people achieving them. Many Companies have operated the programme based awards up to and including President’s & Queen’s Badges, but not everyone goes on to gain our highest awards. If you’re a new Company or haven’t had anyone work towards these awards for a while, then we hope that this article will help you consider how you could get your young people going on to achieve these awards. Although awarded from year 4 in the Discover Programme, the President’s Badge can still be gained through the Challenge Plus Programme. If you’re not sure about what courses are available, or what the requirements are, there is more information available from your Battalion or Regional HQ. Often seen as a pathway to Queen’s Badge, the President’s Badge is, itself, a very significant achievement for a young person. For many BB young people, the award marks a real milestone and offers a snapshot of the wider organisation. Participants have the opportunity to participate in activities with BB members from other Companies as well as volunteering their own time in aid of Company and Church. Most of the work required for the award can actually be done in a Company setting as part of the Discover Programme, or by gaining The Bronze DofE Award. However, the pathway to the award also requires a non-residential team work experience, such as a Building your Skills course (usually held at Battalion level), faith development and also a minimum of ten hours volunteering in the Company or Church. Also, the young person should take part in an activity-based residential, such as BB camp. 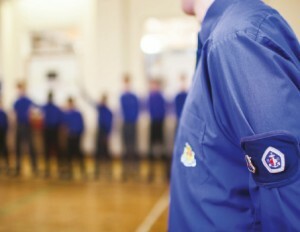 The Boys’ Brigade’s highest youth award is regarded by many former members as the highlight of their time in the BB. It aims to challenge young people individually to fulfill their goals, talents and ability to help others. The award also gives participants opportunities to develop their faith, build friendships with other BB young people and provide pathways for leadership. Before the Queen’s Badge journey gets underway, young people (and leaders) need to reflect on the rewards on offer, but also to consider the commitment and possible sacrifices involved. Once there has been time to digest the Queen’s Badge Record Book, it’s important to arrange the Candidate’s Meeting with your local Queen’s Badge Advisor - and importantly - with a Company Mentor. These two individuals are really important points of contact for the young person throughout the Queen’s Badge journey. The Company Mentor doesn’t necessarily need to be the Captain or Leader in Charge. Sometimes it’s worth delegating this task to a young leader who’s had recent experience of the process. It’s important to note that the Queen’s Badge Record Book is really helpful in getting young people going. It provides them with lots of information, and it’s theirs to keep. Timing is important in the planning stages. Work on the award is best carried out over two sessions and the key courses that candidates are required to attend (Skills-Based Training and the Completion Residential) must have a six-month gap between them. Deciding on the best activities to choose will normally be based on local options, but don’t be afraid to go on a wider path. The Queen’s Badge can run in conjunction with The Duke of Edinburgh’s Award. If possible use Specific, Measurable, Assignable, Realistic, Time-related criteria. E.g. Over the next six months I will improve my golf through additional practice and participation in monthly medals. I want to reduce my handicap from 12.6 to 8.6 during this period. While all the work is going on it’s important to record what’s been happening in the Queen’s Badge record book. It’s better to do this throughout the process and should detail what’s been achieved and give the Company Mentor and Queen’s Badge Advisor an idea where additional support is needed. The Queen’s Badge Record book is the most common method to recording, but candidates may choose an alternative, such as blog or vlog. The most important aspect is that the candidate’s planning, experiences and work is recorded in some fashion. Reporting for this section should include what has been agreed with leaders in the relevant section. Queen’s Badge candidates should be learning from leaders in these sections and, importantly, using some of the skills learnt at the skills-based training courses. The key words are responsibility and within, they shouldn’t just turn up and watch from the side lines but get involved in the planning, delivery and review of the activity that they do. Coach, teach and lead at an external organisation. If the young people are struggling to get opportunities for this section, arrange to gather the young people together from your area who are completing their Queen’s Badge. They could then devise a project that addresses a need in your community. If it’s possible, consider combining the Queen’s Badge work with The Duke of Edinburgh’s Award. Activities carried out for one can count towards the other - the main addition is the Expedition Section which is compulsory in the DofE Award. You may already be offering this as part of your Company programme, but if not, consider pairing up with another local group to widen the possibilities for your young people. There may even be a Battalion centre where members from multiple Companies can join together to participate in the expedition work. Euan Walker has been a member of the 7th East Kilbride Company for the past 13 years and achieved the Queen’s Badge in 2016. Following the Queen’s Badge experience, Euan has now embarked on the KGVI youth leadership course. Euan worked his way through the Company, achieving the President’s Badge with the ultimate aim of gaining the Queen’s Badge. He decided that he would volunteer with Cancer Research UK as this is a cause which means a great deal to Euan, devoting a total of 50 hours. Already a guitar player, Euan decided he wanted to learn how to also play the ukulele for the Skills section of the award. Thanks to the encouragement of the Queen’s Badge, he’s now been playing the instrument for two years and even performed a concert to over 200 people! Taking responsibility in the Company and Church, Euan opted to work with the Company Section. Thanks to his expertise in compass and map work, Euan helped younger members to prepare for the challenge of the Kilbryde Hike. 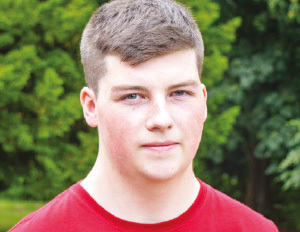 In summer this year, Euan will spend several weeks volunteering in Ecuador, something he says wouldn’t be possible without the confidence he’s built up through the Queen’s Badge and KGVI. Euan has also been able to get involved in Scotland-wide events, such as the Strive young leaders’ event. The final requirement before you can apply for the award is the Completion Residential event, which is usually organised by Battalions or Area Groups. Taking place over a weekend, the course provides the young people attending an opportunity to share experiences, reflect, evaluate and celebrate achievements.